Aaron Sexton is just 17 and is still in school at Bangor Grammar - but the devastating speedster has already made his senior Ulster debut and is already getting plenty of attention. Sexton has been on duty for Ulster A in the Celtic Cup this year where he has been in rich try-scoring form, crossing for seven scores in six games. The youngster made his senior debut in a pre-season friendly against Gloucester and has already set records for the province. 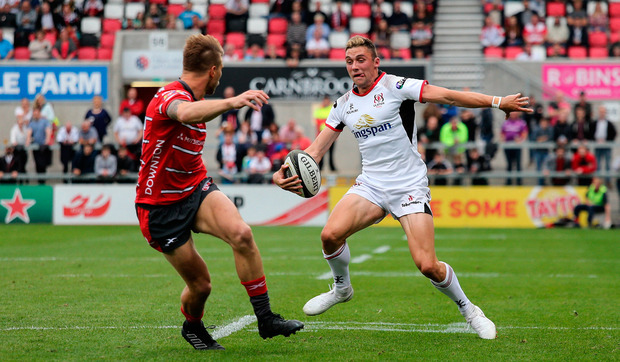 Ulster revealed on social media that the sprinter clocked a top speed of 10.5m/s (37.8km/h) in the Celtic Cup game versus Cardiff, the fastest speed ever recorded by an Ulster player in a match. 7 - Aaron Sexton touched down for 7 tries in the 6 #CelticCup games. .5 - He clocked 10.5m/s (37.8km/h) in the game versus Cardiff, the fastest speed ever recorded by an Ulster player in a match. Ulster scrum-half John Cooney has been very impressed with what he has seen of the teenager and speaking to Luke Fitzgerald and Will Slattery on The Left Wing podcast, he tipped Sexton as one to watch going forward. "He got called into train with us the other day - I'm pretty sure out of school! He played for the U20's the other day and scored a try, what seemed easy for him, against Leinster from 50m. He gassed everyone on the outside, stepped the fullback and nobody could get near him. I'm pretty sure he is going to be a big future star." Sexton has represented Ireland schools and Ulster U20 and it will be interesting to see if he gets any further senior opportunities this year - if his school schedule allows it!